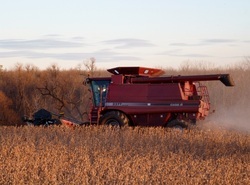 WCS Harvesting was started in 2009. Waste Control Service had provided hay cutting services previously, but in 2009 Keith decided to branch out a little more. We purchased our first combine that year and never looked back. Presently we are harvesting 4000+ acres of corn and cutting 9000+ acres of hay. We added our first Corn Planter in 2011 with variable rate seeding and fertilizing ability. We are constantly changing to meet today's farm needs.